This huge Schubert box contains all his symphonies, two of his masses and one complete opera. It plays for 8 hours and 34 minutes spread either between 8 CDs or all on one Blu-ray Audio disc. The latter also contains a 38 minute video talk by Harnoncourt. The other advantage of the BDA is that all the music is in higher definition stereo and in surround. Whether there are any practical advantages in having so much music on one disc is questionable. In some ways the 8 CDs are a simpler format to use, and unlike, say, the complete Solti Ring (Decca 4786748) which can be said to belong on a single disc, these ten works don't have to live together. This Berliner Philharmoniker Recordings (BPR) issue is packaged in a luxurious box of sufficient complexity to justify a review on its own. The 8 CDs and 1 BDA are in a mini filing cabinet with a lid, and the large booklet containing the notes is sized to match and attached permanently to the box casing. The whole is then covered with a single loose sheet containing information about timing and recordings not all of which is available in the book. When the cellophane wrapper is cut, this sheet becomes a loose item which fits nowhere. The box itself will not fit on a CD shelf in any orientation, nor on a video shelf. It becomes a sort of musical ornament that lives in isolation in one's record library. It is very attractive to look at but inconvenient in use. There has to be a better answer and I hope BPR will come up with one next time they wish to celebrate a collaboration with a great conductor. I should lay my cards on the table and say that I learned the Schubert Symphonies from the Philips LP box recorded by Wolfgang Sawallisch and the Dresden Staatskapelle released in early 1968. This was greeted as one of the finest sets issued up until that point. What I have realised, listening to Harnoncourt's generally slower performances and then comparing with not only Sawallisch but also with other recordings in my collection, is that Sawallisch is actually quicker than most in the fast movements: Harnoncourt is generally nearer the 'norm' but to my ears, often too slow. 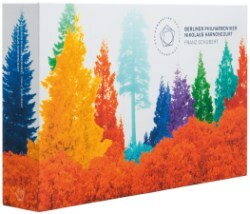 Nonetheless, since this new box from BPR is arriving in a competitive market, comparisons, though odious, are inevitable so I must mention in addition to Sawallisch, Dausgaard in 1 and 2, Beecham and Kleiber in 3 and 5, Rattle and Solti in No.9. It should be noted that Harnoncourt uses the less common numbering of 7 rather than 8 for the Unfinished, and 8 rather than 9 for the 'Great' C major. The First Symphony establishes the parameters for Harnoncourt's entire survey, namely that the Berlin Philharmonic plays magnificently, sounds to be quite a big band, and gives a crisp and enjoyable rendering. The same goes for the Second and Third symphonies. Harnoncourt clearly loves Schubert's music, sometimes loves it too much I feel, because he frequently inflects the rhythms and sometimes whole phrases in a way that draws attention to his conducting and away from the propulsive line of Schubert's writing. The six early symphonies have in common a bottomless fund of lovely tunes and a rhythmic vitality that often matches Beethoven's Seventh. Harnoncourt's interventions are sometimes quite extreme. For example he draws out the final three chords of the Fourth Symphony in a way that sounds forced; he slows down markedly for the second subject of the first movement of No.6, moulding the music to his will and losing a lot of momentum in the process. The three fast movements of the Fifth Symphony are much slower than Sawallisch whilst the slow movement is much faster, making for less contrast overall. Harnoncourt spends a lot of time looking, one might say, at the scenery. In the opening allegro some gentler moments are so slow that there is again a loss of momentum and joyfulness. The trio of the third movement is so slow all the stuffing seems knocked out of the music. Compared to the Dresden Fifth this is bordering on dull. The first six symphonies are essentially classical, like Haydn, Mozart and early Beethoven. Only in the last two does a very different Schubert emerge. After the Sixth Schubert tried four times to produce a 'Grosse Symphonie'. Three attempts were abandoned (according to Newbould, D.615, D.708a and D.729) but in the fourth attempt he got as far as the third movement before he gave up. This is the work we know as the Unfinished, of which just the two completed movements are performed here as usual. Here Harnoncourt is on more solid ground with both his slower tempi and his romantic approach, because this and the 'Great C major' are a new kind of symphony, looking forward to Schumann, Brahms and Bruckner. The first movement is a generous interpretation of allegro moderato and the following andante con moto is only a little slower: but what a gorgeous and moving performance. I cannot imagine the Unfinished being better played. The overall timing is very nearly half an hour. Schubert may well have decided that those two movements were enough because he offered them to a music society for performance. In the event this did not happen and the Unfinished had to wait until 1865, long after Schubert's death, to have its first performance. The final symphony, the 'Great C major' was thus Schubert's fifth attempt to write such a work. It too had to wait until the 1860s to be performed complete. It was given in cut performances and on at least one occasion it was played complete but over two evenings because of its length, about one hour. From about the time of the Unfinished entering the repertoire, the Great C major also became a staple of European concert halls. As with the rest of this cycle Harnoncourt's tempi are steady but he keeps rhythms crisp, much helped by the timpanist using hard sticks. The inner voices in the slow movement are very clear despite the richness of the overall texture. It is difficult to imagine a performance sounding other than grand and beautiful and it is so here. As previously, Harnoncourt has his quirky way with phrasing and rhythmic inflection. Also as previously these emphases serve to disturb the flow, notably during the scherzo where he allows the tempo to get slower and slower until one's patience is tried. After all this the faster than expected tempo for the finale is a surprise but the rhythms bounce along most winningly. The expected diminuendo on the final chord is extreme. On the surface an advantage of the new BPR issue should be the quality of sound as well as the Berlin orchestra. Not so. The old Philips recordings were always a bit variable on LP but the CD reissues resolved that and sound as good as these new ones. Furthermore the Dresden Staatskapelle are every inch as good as the Berliners. The BPR Blu-ray Audio disc is at a very high level sending one quickly to the volume control compared to the CDs, and even in surround it is not that much of an improvement over the new CDs or the 48-year-old Philips analogue recordings. There is a long essay in the BPR booklet by the Director of Archives at the Gesellschaft der Musikfreunde in Vienna, Otto Biba, which emphasizes the efforts made by Harnoncourt to go back to the earliest manuscripts and play Schubert the way he would have expected. This would be convincing were it not for the note in the Philips LP booklet saying almost the same thing about the Sawallisch set. Both conductors consulted the Bärenreiter editions which have been coming out over the past few decades and they have arrived at very different positions. And whilst on this matter, neither conductor is directing a period orchestra so neither is likely to have come particularly close to Schubert's sound-world in any case. As for the rest of the music, the two final settings of the mass, the A flat major and the E flat are both very beautiful. The E flat is perhaps the more interesting musically with some unexpected harmonies and some ingenious orchestration but both pieces remind me that Schubert's reputation does not rest on this area of his output and that more enjoyable mass settings came from the pens of Haydn and Mozart. Maybe other reviewers will find more to say but for me these, though lovely, settings could be bypassed at little cost. The same is not the case with the last two CDs and the last couple of hours or so of the Blu-ray Audio disc, the opera Alfonso und Estrella. This was my first encounter with Schubert's opera and I was delighted by what I heard. Not only is it beautifully recorded with voices placed clearly in front of the orchestra, and mostly exemplary diction and pitch control from the singers, but it is a non-stop outpouring of melody with not a little drama. The closest parallel for me are the operas of Weber. This is definitely an early romantic opera, not a classical piece. The story of young love and the power politics of a distant medieval kingdom is curiously antiquated and it has not achieved much acceptance in the opera house. As music it is a delight and recommended most highly to those who purchase this set for the symphonies and see the rest as appendices. A few other recordings exist including a filmed performance conducted, as here, by Harnoncourt. He obviously loves this piece as he does all the other music in this epic survey.